These poems, the best I've seen yet in a career that already outshines most living poets (and plenty of dead ones), offer still more evidence that Mary Biddinger is one of the best, most entertaining poets out there. But these aren't just exercises in clever line breaks and punchy imagery. 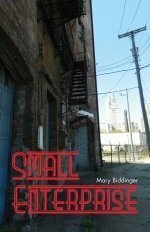 With her trademark blend of wit, surprise, and poignancy, Biddinger scrutinizes the many spheres of human existence, further pushing the stylistic envelope whilst maintaining her fidelity to art that matters, to language that roundhouses the psyche into something dizzyingly close to enlightenment. Tonight’s theme is: you are a baby nihilist. of countless lake flies and a sinister duffel bag. anyone walk through your body, little cadet. But the best way to learn is to disobey. And that was the first thing he ever taught me. Mary Biddinger is the author of the poetry collections Prairie Fever (Steel Toe Books, 2007), Saint Monica (Black Lawrence Press, 2011), O Holy Insurgency (Black Lawrence Press, 2013), and A Sunny Place with Adequate Water (Black Lawrence Press, 2014). She is also co-editor of The Monkey and the Wrench: Essays into Contemporary Poetics (U Akron Press, 2011). She teaches literature and poetry writing at The University of Akron, where she edits the Akron Series in Poetry. Biddinger is the recipient of a 2015 National Endowment for the Arts Creative Writing Fellowship in poetry.